Everyone who visits or rents a villa in Barcelona wants to know the best place to capture the photographs and memories of a lifetime. There are many well-known tourist areas like Montjuïc Mountain and Mount Tibidabo from which to gain the perfect city-scape photograph, but what about the lesser known areas? Here are a few ideas that detail a few secret spots where you can capture the most fabulous views of the city. MNAC, otherwise known as the National Museum of Art Catalunya, is a spectacular structure on its own, but if you venture onto its rooftop terrace you will gain some of the best views of Barcelona. It costs a couple of euros to reach the high terrace but once there you can see everything from Plaça d’Espanya to the Sagrada Familia and the Magic Fountains of Montjuïc mountain. Close to MNAC is the old bullring of Las Arenas located at the opposite side of Plaça d’Espanya. It’s now a shopping centre but the rooftop terrace has great views of the Palau Nacional and the city. The bonus to this terrace is that it is home to an abundance of trendy bars and restaurants so you can happily sip a glass of wine while enjoying the views. 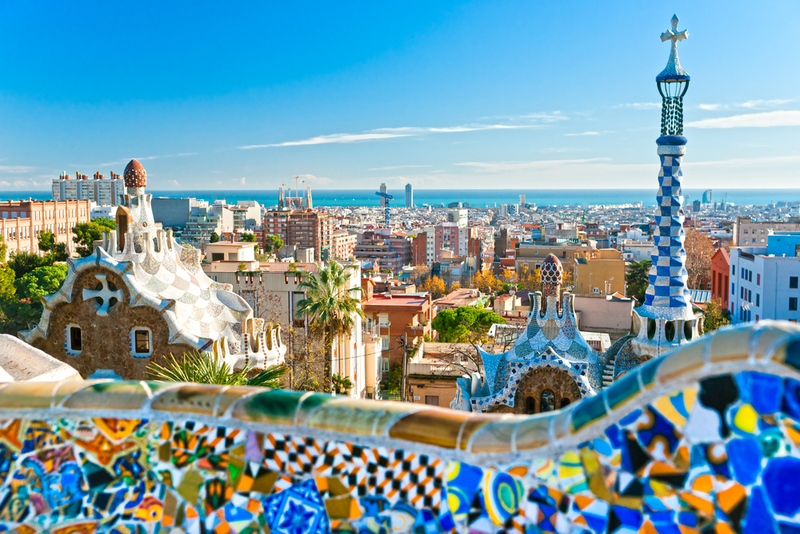 One of the most iconic photographs of Barcelona features the vibrantly coloured mosaics and undulating curves of Gaudi’s Park Güell in the foreground and the city roof tops and the Mediterranean Sea in the distance. Although you have to pay to get into the Monumental Zone of the park, some other views from the park won’t cost you a euro. If you are a keen photographer and wish to capture an aerial view of the city, then you need to ride the cable car! It travels over 100 metres above sea level from the beach of Barceloneta to the summit of Montjuïc, and you will see everything from the bustling port to Las Ramblas and all of the streets in between. This place is a heritage site sitting behind the city on the mountainside and hosts the most incredible panoramas of this vibrant metropolis. The area is also a great place for lovers of military history as it was home to an anti-aircraft battery during the civil war in Spain. From in between Gaudi’s famous towers you can see the tree lined streets of the Eixample district with its rich red and terracotta rooftops and many of the city’s wonderful attractions. This spot offers a full 360-degree panoramic view and is situated in the Serra de Collserola Natural Park, close to the telecommunications tower. You can climb up the tower platforms or admire the vistas from the park. It offers similar views to the ones you will gain from Mount Tibidabo but is more open and you avoid the tourist crowds. 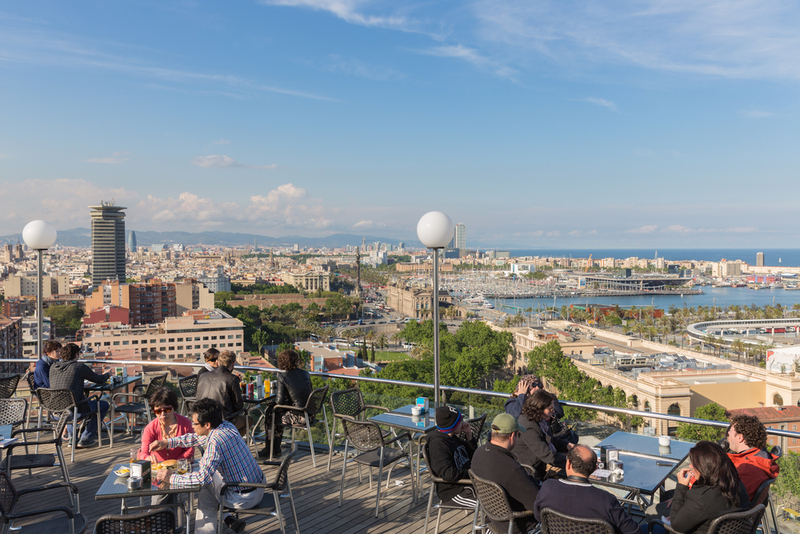 There are also many rooftop bars that offer fabulous views of the city, but the spots above are some of the most unusual places that are close and easy to access from your Barcelona accommodation.